HONG KONG─Fiji have won the Hong Kong leg of the HSBC World Sevens Series each year for the last four years – can they do it again we wonder. With six events of the 2018-2019 World Sevens Series completed (Dubai, Cape Town, Hamilton, Sydney, Las Vegas and Vancouver), and with four more remaining, (Hong Kong, Singapore, London and Paris) the series is poised at a particularly interesting stage. Unusually, USA are leading the table having 113 points, New Zealand are close on their heels with 106 points, Fiji have 101 points and South Africa 89 points. Fiji have tremendous support in Hong Kong, where many of their fans treat Hong Kong as their second home and the team with this support have won consistently over recent years. 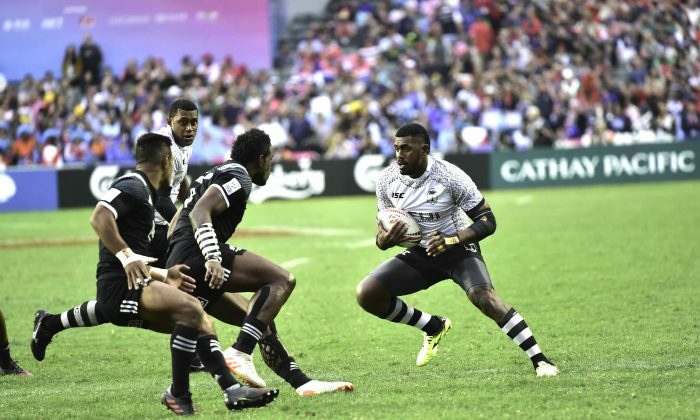 Isake ‘Ice’ Katonibau who played for Fiji in all of those last four tournaments explained to the Epoch Times that they have good support around the world, but Hong Kong is a very special place for Fiji. A kind of lucky charm and it rubs off onto the players. “Friends come in numbers and it is a festival for us. When we are in the stadium tunnel and we hear the fans in Hong Kong, it gives us a good feeling, it’s a rush, and the Hong Kong crowd are our 8th man” he said. However, many of Fiji’s recognized top players are injured and Fiji will be fielding a young squad that has to step up, so Isake thinks it will be hard for Fiji coach Gareth Baber. He said that we say in Fiji, if a player hasn’t won in Hong Kong, then you are not recognized as a Fiji representative. Such is the status of the Hong Kong Sevens! This year, Isake will not be playing in the tournament, as he is recovering from injury and is captaining debutants, the Mourant Fiji Army team in the GFI HKFC 10’s, which started yesterday (April 3rd) and concludes April 4. But no doubt he will still be closely involved with the sevens squad come the long weekend. Talking about the USA team, he said they have exceptional players, very talented players, and a very good coach that has been patient with them. Now they are matured and have lots of experience. They have been playing together for a while, they know each other’s game, bond with each other and if they can continue to perform at that level and be consistent, they will definitely win the series. They are the most consistent team this year so far. But they have made five finals and only won one, so consistency is important. New Zealand, holding second place are always dangerous at any venue, they have such a wealth of experience, a great mental attitude, are well prepared and they know how play in finals and how to win in Hong Kong. They also have had five wins in Hong Kong since the turn of the millennium and have regularly reached the final. South Africa lying in fourth place won the Sevens series in 2017-2018, but have not done so well in Hong Kong of late. They reached the finals in 2017, 2009 and 2008, but have not won in Hong this century. They did however beat New Zealand for third place in the 2018 Hong Kong Sevens. In the draw that took place earlier in March, USA are seeded top of Pool D, and will play England, Wales and Spain, in the group stage. Fiji head Pool C, in an interesting and tough group with New Zealand, Australia and South Korea. South Africa head Pool A and will meet Samoa, Scotland and Japan in the pool stage and the most open group would seem to be Pool B, comprising France, Argentina, Canada and Portugal. On asking Isake about the tough group, he said “It is good to have a hard group. In an easy group Fiji tends to start slowly in the second game”. In a tough group, they get tested early and have to perform each game. This is what they have had the last four years and that focus and hardening has helped them win. Playing alongside this World Series tournament there is the Men’s and Ladies qualifiers, where Hong Kong play against familiar opponents, Tonga, Zimbabwe and the Philippines, avoiding strong European teams such as Russia and Germany. In the Ladies draw, for which only the final is played at the Hong Kong stadium, Hong Kong face Kenya, Papua New Guinea and Uganda in the Pool stage. All of the top four teams had a good start to the tournament on the first day Friday April 5. USA beat Spain 36-7, New Zealand overcame Australia 40-19, England won against Wales 36-19 and South Africa outpointed Japan 22-7.